This old Bishop Crook cast iron lamp post was standing just south of the World Trade Center South Tower in 1982, silhouetted against an early 1960s Donald Deskey designed SLECO lamppost, which I lovingly nicknamed the Bigloop. The bishop crook pole wears a 1940s to 1950s era Westinghouse pendant fixture, that I dubbed the Cuplight. 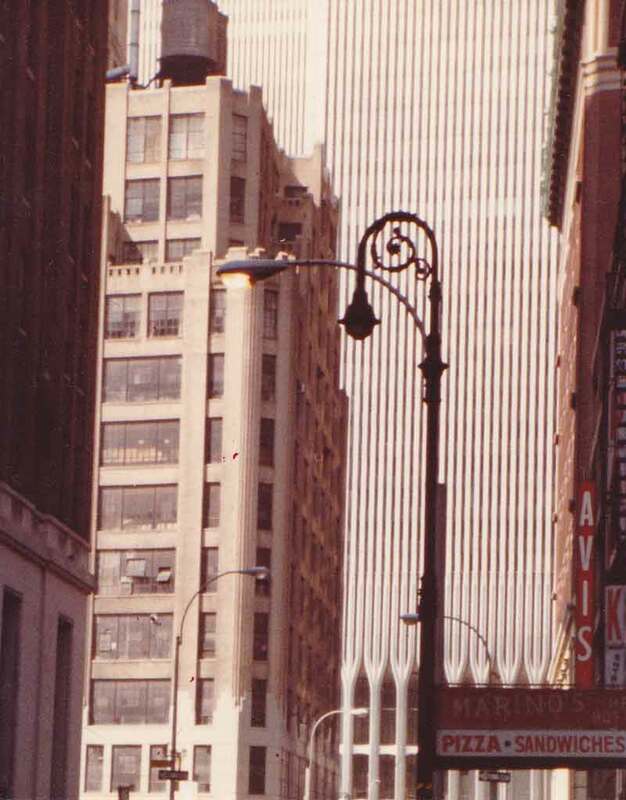 That fixture was perhaps the widest spread of any New York City street lighting fixture until mercury vapor cobra heads eased them out of existence from the late 1950s on. Both World Trade Center towers are visible in the background. I have no idea what, if anything, survived of this scene following 9/11. I suppose I could Google Earth it and find out.